When I start a challenge that involves an era, a story, a movie or a show, heck anything that is new to me, I do research. I worked at a lab once and thought that research was boring. But, I do believe that if your cause is driven by purpose then your research is motivating, inspiring, and can lead you on wild adventures to either dead ends or to the elixer of life. My true scientific research job did not present a clear, tangible purpose, so I found myself disinterested and unable to motivate. Researching the 1920's is fascinating. Consider, this is the latter half of the suffragette period and women's clothing changed drastically. When my modern eye sees these straight boxy dresses, I think, "bleah, it's not form fitting or even skimming. I'll look like a box. I must find a suitable and still true alternative." However, the more I look and read, the more I realize that these boxy outfits are the beginnings of freedom and sports for all women, not just the ones who chose to dress daringly in men's attire to play their beloved athletic pursuit. You'll also see women in fashion plates playing tennis and running! Prior decades found women fully corseted and unable to breathe. So these outfits actually symbolize freedom for women in many, many ways. 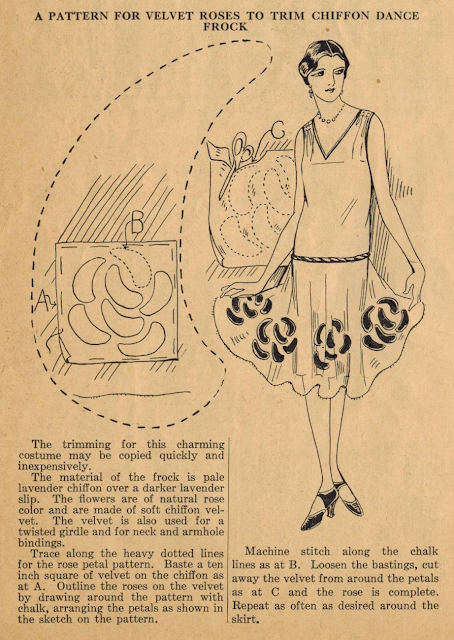 Doesn't the velvet rose applique (above, bottom left) look like what Alabama Channin is doing today with knits? And the bustle back with roses (above, bottom right) is a neat way to use a piece of fabric without cutting it. I didn't know that scallops were so envogue (above top). The jabot I dismissed until I saw how they had Phryne Fisher wear it. Fashion illustrations are interesting to a point, but things get real when you see these fashions on real bodies in motion. I do like the woman's outfit on the far left in the photo of the 2 ladies above. The geometric lines are interesting. So are the cardigans with long belts. Oh how lovely to allow your belly to breathe and move after being corseted, yes? Below the top 4 images are likely the closest to what I may end up making. They feel not only true to the era, but also like a dress I would wear in 2014. Wow, can you believe that we'd still wear garments like what our grandmother's wore 100 years ago? If we were looking at WWI and Edwardian era fashions, the likelihood of wearing their fashions again in 2014, except for costume is much lower. Unless you're a maxi dress gal, you likely don't choose long dresses. Me? I gotta move & be free. I trip on long dresses. So I usually opt for calf length. This magazine cover, Peerless Patterns (buy it on Etsy!) shows women's bridal fashions. I love the roses at the drop waist. That's really pretty. Maybe I could include that on my dress in a flat, to-the-body, style. MacKensie style? I like how these McCalls styles have design lines through the body. We're starting to see the transition between 1910's and 1930's in this. The Aesthetic Eclectic, Chiffon & Lace plus a Green 20's dress.